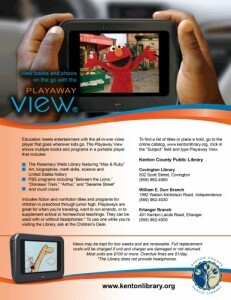 Check out some fun at Kenton County Public Library with the new Playaway View! My family and I already love the library…what’s not to love? Great movies for rainy days, books about everything under the sun, fantastic summer programs! Now they’ve added one more way to have a great time while learning with the Playaway View. 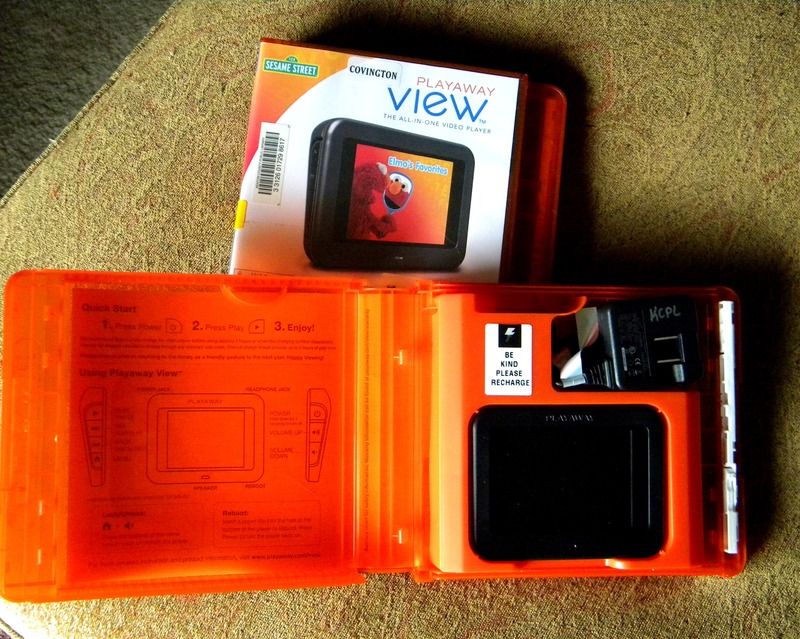 The Playaway View is a handheld video player about the size of your average handheld gaming device such as a Nintendo DS or even some of the larger Smartphones. Each Playaway View comes preloaded with multiple dvd’s…from history to math, Greek mythology to sea creatures and even Elmo, Sesame Street and Scholastic children’s tales. Each Playaway View can be charged (no batteries!) for long car rides and can be used with or without headphones (not included). As you can see, they couldn’t wait to get it home…they were way too curious! We were lucky enough to be asked to check out a pair of the Playaway Views this week and let me tell you, my kids have been loving them! We received one Playaway View loaded with children’s tales such as Strega Nona and Rikki Tikki Timbo (one of my personal childhood favorites)…around 27 tales in all…as well as a View loaded with Elmo episodes. I have a soon to be 8 year old boy and a 5 year old boy. For just a brief moment I worried that the dvd’s loaded on our Playaway Views wouldn’t hold their attention…but I was so wrong! They watched them all the way home from the library, they watched them all afternoon, they asked to take them with us to the pool (to which I said no…but they did try! ), they watched them that evening and the next day. They giggled at Elmo like they had never watched it before. They found favorite tales from the Scholastic selection and watched them over and over again. They begged me to go online and put requests in for four more of the Playaway Views loaded with Greek Mythology, History and more Scholastic children’s tales. They ask me daily if they are ready to be picked up yet! We have tried very hard to “unplug” this summer…fewer video games, fewer cartoons, television off as much as possible…but this is something I make an exception for. Not only are they really, truly entertained by excellent programming but I feel that they are learning so much at the same time. While my oldest was watching some of the Scholastic children’s tales we had a chance to talk about other great books he could check out the next time we visit the library, and I could share some tales I loved from my childhood. While youngest was watching Elmo he had a chance to refresh some of his preschool skills for the big jump to Kindergarten this year. All in all we are very impressed with the new Playaway View and suggest making a trip to check them out for yourself! The Playaway View is available for checkout from the Children’s section of your local branch of the Kenton County Public Library. They are super popular so I suggest making a request online so you won’t miss out! Due to the huge response to these little handheld video players the library has plans to extend their selection but for now there is a wait list for nearly all of the available Playaway Views. The Playaway View is a 14 day check out item, to adult cardholders, and can be renewed. There is a limit of 2 Playaway Views per card. The caveat: fines are $1 a day and lost units can cost as much as $100 to replace. The Playaway View is available with fiction and non fiction programming ranging from preschool to junior high level and are great supplements to homework or homeschool curriculum. If you’d like to take a look at a Playaway View before checking one out to take home you can do so at the Children’s desk. 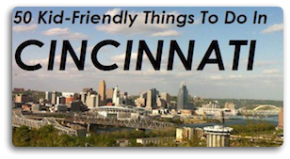 For more information visit the Kenton County Public Library website, and make sure to ‘like’ the Kenton County Public Library on Facebook. Please stop by In A Galaxy Far Far Away to find out which galaxy Amy and her crazy kids are in this week! My boys saw this and now we’re going to have to borrow these too! Thanks Amy. These things are awesome! We have 2 out this week and the kids are in love.